Optimises performance in intelligent automotive charging systems. 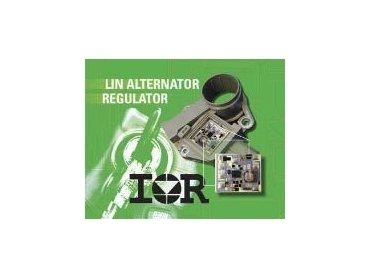 INTERNATIONAL Rectifier has released a local interconnect network (LIN) controlled alternator-regulator for next-generation vehicles. It optimises performance in intelligent automotive charging systems for increased efficiency and improved fuel economy. Intelligent vehicular charging systems are used when dynamic control of the alternator output and torque is desired for optimal battery charging, electrical system power management, and alternator-engine interaction. Dynamic alternator control enables improved electrical system efficiency and reduces engine idle speed for greater fuel economy. In contrast to analogue interfaces, IR's platform offers integrated, programmable load response control features, programmable field excitation of current or temperature and regulator feedback of fault status. The LIN solution can be uniquely addressed for compatibility with up to 15 other modules on the bus and all data can be transmitted or received in a single pass. The LIN interface provides a simplified method of reliably achieving the bidirectional communication required for maximum alternator performance in an intelligent charging system. The LIN serial interface is used by the engine control unit (ECU) to transmit charging voltage setpoint from 10.7V to 16V, load response control ramp and cut-off speed and the field excitation limit. The voltage setpoint command can also disable the field driver for a momentary no-output condition. Signals transmitted to the ECU from the regulator include field excitation duty cycle, current or temperature, and the fault status. Transmitted fault codes provide unique indication for mechanical, electrical, temperature, communication and timeout errors. In addition, the LIN-controlled alternator-regulator includes short-circuit protection, EMI and ESD suppression and consumes less than 200μA standby current. The IR LIN-controlled alternator regulator is assembled using thick-film hybrid technology for reliable high-temperature operation and parametric stability over the entire operating temperature range of -40ºC to 150ºC. The hybrid circuit can be customised to the application to optimise performance and reliability. It can be assembled into a custom housing with an insert-moulded lead-frame designed for flame-soldering or heavy wire bonding. Thick-film technology also enables precise laser trimming of discrete resistors.